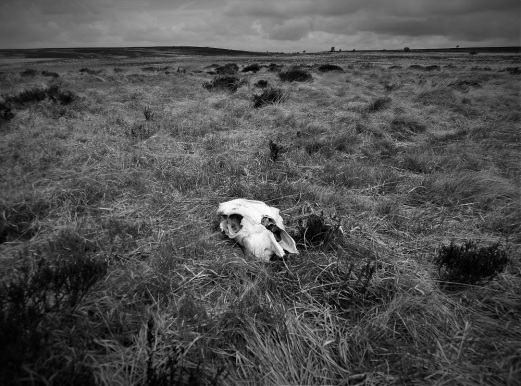 Ed slowed his stock horse as he approached the bleached cow’s skull. “Easy there, Chester. Let’s have a look.” The aging rancher stiffly swung a leg over his mount, planted it on the grassy field, and then slipped the other booted foot out of the stirrup. He squared himself on the ground, hitched up his gun belt, then looked into the cloudy autumn sky. “Looks like rain, don’t you think?” The horse was impassive. A cold wind blew across the plain, but Ed didn’t take any notice. For a reason he couldn’t explain, he was captivated by the worn remains at his feet. Then the first drops of rain began to fall, lightly kissing the brim of his hat, his boots, even the skull. He turned back toward Chester and froze. His companion was standing stoically, patiently next to the body on the ground, Ed’s body. Then he saw another rider approaching from the way he’d come, as oblivious to the downpour as Ed was. It was a pale horse, the rider was death, and she was beautiful. As she approached, he could see her alabaster skin, full red lips, a gown as black as midnight, short, obsidian hair slicked back, and deep brown eyes a man could drown in. She stopped just before she reached the dead man on the ground. Chester shied away from her and moved away to Ed’s left. “It’s time, Edward.” She didn’t have to explain herself. He knew exactly what she meant. She offered thin, white fingers, nails painted the same crimson as her lips. Her touch would have been cold if he were still alive. She effortlessly pulled him up behind her. Then she guided her anemically white steed in a direction that hadn’t been there a moment ago. And then Chester was alone, and the rain poured down on the living and the dead. I wrote this for the #writephoto challenge hosted at Sue Vincent’s Daily Echo. Every week, Sue posts one of her original photos to be used as a prompt to craft a poem, short story, or other creative work. I recently wrote a story about death, and today’s prompt seemed to fit the theme. Also, the cow’s skull reminded me of the classic cowboy trope, so I made Ed a rancher. Great brooding atmosphere of the plain, James. Very well written. Glad you liked it, Sadje. Nice tale. You really set the scene quite well. Great imagery. “…a direction that hadn’t been there a moment ago.” Nice! Thanks, Sue. It’s not easy describing a direction that doesn’t exist three-dimensionally. Death is personified as both male and female depending on the culture. A good twist, I didn’t see that coming.